ITS supplies two variations of fast release terminal which both offer access to secure print release and Find Me printing. Secure print release allows print jobs to be collected once a user has identified themselves at the device whilst Find Me printing allows users to print to a virtual print queue and release jobs at any associated device. • Proximity card for use with the ITS Fast Release Terminal. • Numeric ID code for use with the ITS Numeric ID Fast Release Terminal. 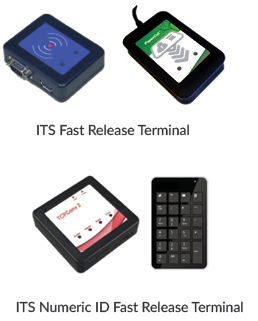 The cPad Terminal is a touch screen unit with an integrated PaperCut interface that plugs into the selected MFD via an access port. It is hardware neutral and can turn almost any copier or multi function device into a PaperCut tracked and controlled machine. 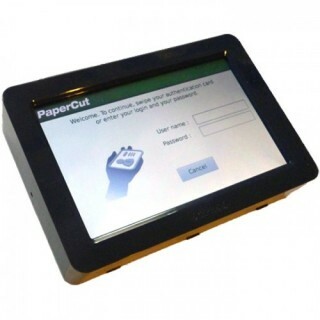 The cPad has been developed in partnership with PaperCut and aims to bring the touchscreen functionality seen on embedded solutions to a vendor independent hardware offering. The cPad can also be used for secure and Find Me print release on standard desktop printers.